Home > Practice Yoga > Types > Vinyasa yoga > Am I A Yogi Yet? Am I A Yogi Yet? When I first went to a yoga studio, I was not sure what to expect. Coming from a fitness background I had experienced exercise in a number of forms, from aerobics to running to strength training to swimming. Having played soccer, competed in gymnastics and played university level women's basketball, I thought I knew what movement was about. Then I walked into the yoga studio to my first yoga class, vinyasa flow. At the time, I knew I was heavier than I wanted to be. I knew I was older than many of those in class. I knew I had not been as committed to my workouts. I acknowledged I had taken time off from exercise with some family life that only elevated my weight and made me so very aware I needed a new inspiration. I took a place at the back and waited for class to begin. For ninety minutes, I did not know the terms, and was unfamiliar with the sequences. I recognized a few movements but was baffled by the wording, and was challenged by my lack of balance and seemingly minimal strength. But, I was somehow thrilled at the same time. I felt something drawing me in, propelling me to continue. This was different than anything I had ever experienced. The teacher was distinct in guiding us through each move with clear description and cues for each step. I felt awkward, not certain of the transitions, and knew I did not look like any of these young slim bodies who moved with such grace. I felt intimidated by the mirrors and knew I had work to do. What was this yoga? What was this wonderful series of movements reaching every aspect of my physical self, and then some? When the class ended, I left feeling like something shifted inside. As I walked to the car, I felt shaky. I knew I had to come back again. The teacher had referenced us as yogis. I was thinking I was quite far from that. As that first year of yoga progressed, I gradually increased my classes per week as I gained endurance and lost my extra pounds. In class, I moved my mat space closer to the front and began to use the mirror for focus and checking alignment. I started reading everything I could on Yoga. I took every workshop offered at the studio that year, subscribed to yoga posts and online magazines. I began to realize there is only more to learn. As I moved into my second year, I signed up for the Yoga Teacher Training at the studio to (as they say), 'deepen my practice'. I was amazed at what fit really is, and wondered why I never did this before now. I no longer feel awkward and am working on mindfulness and intention. And recently, my husband said, "So, what is yoga, anyway?" I invited him to come along with me next class. 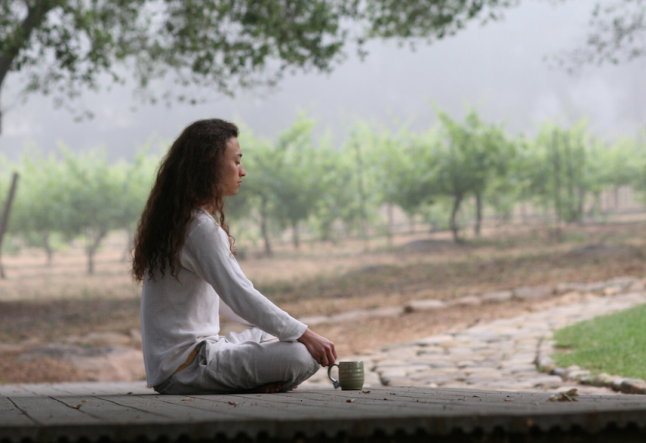 And, as he sat in the back, at that beginning place, I heard him say to the student next to him, "That is my wife over there, the Yogi on the right..." . I loved it.